I will probably never witness anything like this in person again in my life. It was one of those experiences that you only see on National Geographic Channel!! 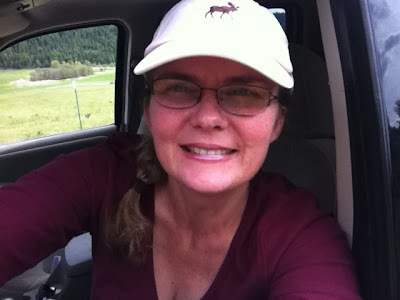 I was driving home, and was on the very last stretch of the road, when I came around the bend of the corner. Flying through the air was a HUGE Red Tailed Hawk, with a snake dangling in his talons. I could see him flying, against the blue sky, gaining altitude with his soon to be dinner lifting over my head. But then he saw me, and before all the details of what was happening actually registered in my mind, the bird dropped the snake, and it flopped onto the ground, just a few yards from me. The hawk landed in the tallest nearby tree, and both of us surveyed what just happened. Reality began to take hold, and I couldn’t believed what I just witnessed!! If the angle had been eerily perfect, the snake would have descended into my open window and landed smack in the middle of my lap. Curiosity got the best of me, and I wanted to see if the snake was alive or dead. The hawk and I both had the same wish…get to the snake first, but he let go of his desire, and promptly flew away when he could see that his dinner was gone, and another predator, bigger than himself, was on the scene. 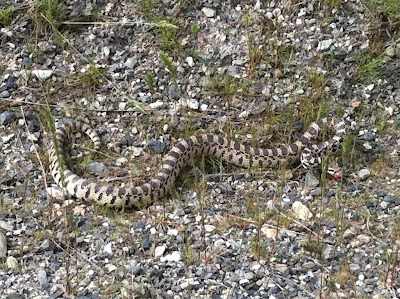 I drove up to the snake and he promptly coiled himself up and swayed his body gently in each direction. His eyes were piercing my own, and his tongue was in motion. I edged the car closer, and he struck at my tire. I took a good look at that snake and was horrified to see a triangular shaped head, skinny neck, and the behaviors of a Rattle Snake. I was told there were no Rattle Snakes where we lived, but this was a living, breathing, very rattle-snake-like creature, and he was just under a mile from my house. I grew up in California. I know what Rattle Snakes look like, and I know what they are capable of doing. I DID NOT want a Rattle Snake that close to my house. But while he had the mannerisms and look of a Rattle Snake, he didn’t rattle, and that was very puzzling to me. I backed up the car and pulled forward again. He coiled, swayed, spit his tongue, gave me the evil eye, but he did not rattle. I threw a few pebbles at him. He was not happy. But he made no sound at all. Something wasn’t right! I called Daryl. I knew I could take care of the snake and squash him, but if he wasn’t poisonous, I didn’t feel any need to kill him, so I wanted a second opinion. 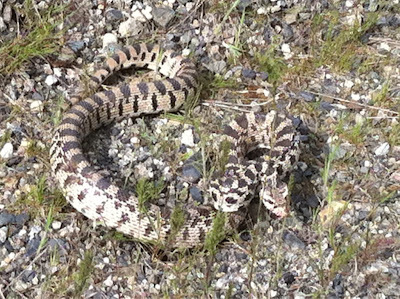 Soon he arrived with our friend Rob, and both of them confirmed that they thought the snake was probably a Bull Snake. If you look closely, you can see a bit of blood on his mouth. I’m sure he had struggled with the Hawk, before experiencing his rude landing. He did not like me one bit, and acted in a very evil manner towards me. He actually should have been thanking me, because I saved him from becoming lunch. See that head?? That is triangular if I’ve ever seen triangular! 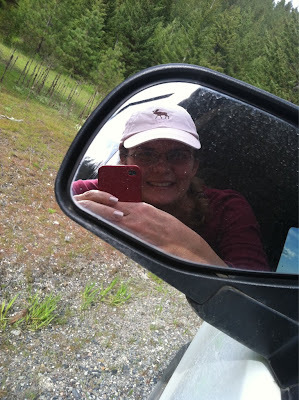 I was quite happy to be safely up in my vehicle! A picture of the girl who was tormenting the snake with pebbles! We ended up guiding him away from the road and into the woods. He took refuge under some bushes, in the deep grass, and hopefully found his way home! It was a bad day for the Hawk, a good day for the snake, and a mixed day for me. I was glad he wasn’t a rattler, but I don’t like knowing that there ARE snakes in my neck of the woods. Ewwwwww! Glad he didn't land in your lap! I hate snakes!! !